3. Field Guide 1: Climatic and Geographic Zones. Significant refinements of biogeochemical methods applied to mineral exploration have been made during more than twenty years since the last major publication on this technique. This innovative, practical and comprehensive text is designed as a field handbook and an office reference volume. 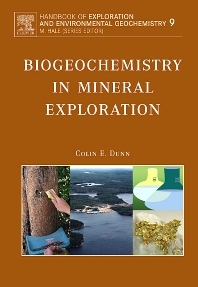 It outlines the historical development of biogeochemical methods applied to mineral exploration, and provides details of what, how, why and when to collect samples from all major climatic environments with examples from around the world. Recent commercialization of sophisticated analytical technology permits immensely more insight into the multi-element composition of plants. In particular, precise determination of ultra-trace levels of ‘pathfinder’ elements in dry tissues and recognition of element distribution patterns with respect to concealed mineralization. Data handling and interpretation are discussed in context of a wealth of previously unpublished information, including a section on plant mineralogy, much of which has been classified as confidential until recently. Data are provided on the biogeochemistry of more than 60 elements and, by case history examples, their roles discussed in assisting in the discovery of concealed mineral deposits. A look to the future includes the potential role of bacteria to provide new focus for mineral exploration. Analyses of samples from the controlled environment of Britain’s Eden Project are presented on an accompanying CD as part of a database that includes, also, the potential role of the halogens to assist in mineral exploration. Data on this CD provide a ‘hands-on’ approach for the reader to interrogate and personally assess real datasets from the burgeoning discipline of biogeochemical exploration.